LAUSANNE, Switzerland — The World Baseball Softball Confederation today unveiled the groups and the Official Look for the LG Presents WBSC Women’s Baseball World Cup 2016 in Gijang, South Korea. The announcements mark 100 days to the opening of the VII WBSC Women’s Baseball World Cup, the pinnacle platform in women’s baseball, which will be contested from 3-11 September. Four-time defending world champions Madonna Japan will begin in Group B, along with Canada, European representative Netherlands and India. 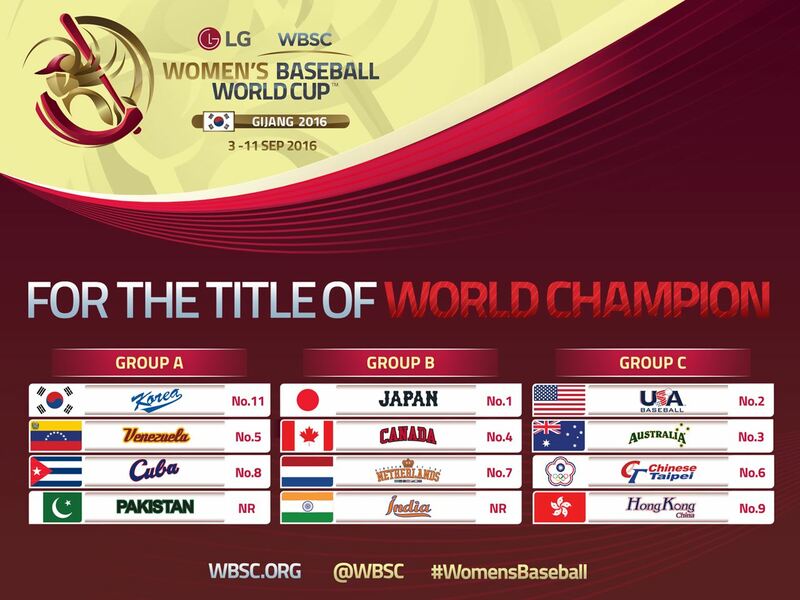 Women’s Baseball World Cup 2014 second- and third-place finishers United States and Australia (the “Emeralds”) will begin the path “For the Title of World Champion” out of Group C, together with Chinese Taipei and Hong Kong. Pakistan will make its debut on the world stage in Group A, alongside Cuba, Venezuela and host nation South Korea. The top two nations from each group will advance and battle each other in the Super Round, which will determine the pairings for the world championship title game and the 3rd-4th place match. The official tournament schedule will be released in the coming weeks. The official tournament microsite of the LG Presents WBSC Women’s Baseball World Cup 2016 Gijang has been launched in five languages, including the language of the host nation. Korea television giant, SBS, has been awarded the exclusive rights to serve as the host broadcaster of the LG Presents WBSC Women’s Baseball World Cup 2016 Gijang.